The monument commemorates the 150th anniversary of the climbing of Mount Barney by Captain Patrick Logan. Logan achieved the climb alone on the 3rd August 1828. Logan had discovered Mt. Barney in 1827 during his major expedition having walked from Ipswich. 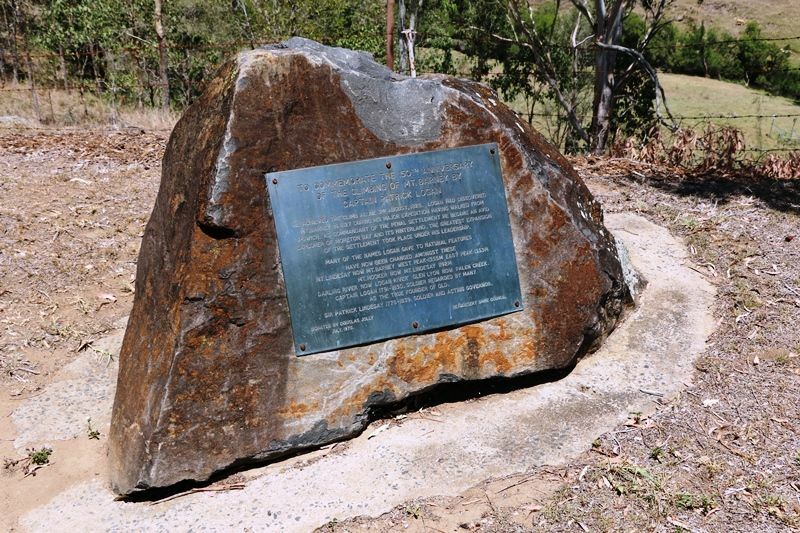 As Commandant of the Penal Settlement he became an avid explorer of Moreton Bay and its hinterland. The greatest expansion of the settlement took place under his leadership, many of the names Logan gave to natural features have now been changed. He achieved the climb alone 3rd August, 1828. Logan had discovered Mt. Barney in 1827 during his major expedition having walked from Ipswich. As Commandant of the Penal Settlement he became an avid explorer of Moreton Bay and its hinterland. The greatest expansion of the settlement took place under his leadership. Darling River now Logan River Glen Lyon now Palen Creek. as the true founder of Qld. Sir Patrick Lindesay 1778-1839. Soldier and Acting Governor.